Familiar to most by way of the 1980 motion picture directed by David Lynch, the tragic tale of Joseph Merrick remains a devastating real life parable of human cruelty and indignity, how we treat otherness, the arbitrary role of luck in one’s circumstances and how a gentle spirit can shine forth amongst even the greatest of adversity. Plenty then, for a stage version of Merrick’s story to get its teeth into. 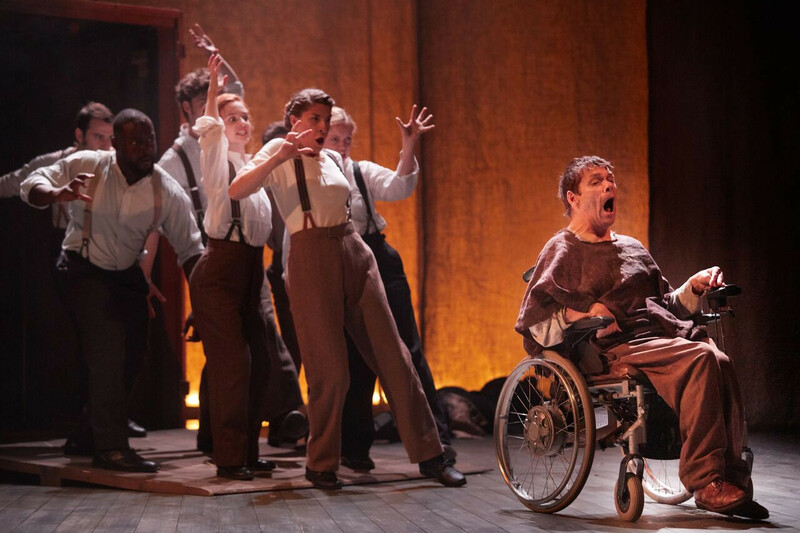 Additionally, this collaboration between Bristol Old Vic Theatre School and Diverse City features the role of Merrick played by Jamie Beddard who has cerebral palsy. Having witnessed other actors “who took on the physicality of someone with a disability as a type of acting challenge”, director Lee Lyford’s decision to cast Beddard in the lead role is refreshing and offers a poignant, contemporary twist to the play’s themes. Each scene is delivered under a visible chapter title – often appearing on a backdrop, bedsheet or curtain – and strung together by some fittingly sombre swathes of live cello. Merrick is introduced in his capacity as a freak show exhibit for paying customers before he is discovered by the curious and ambitious Frederick Treves, a prominent surgeon at a London hospital. After Merrick is robbed of all his earnings by his manager, he returns to London and reunites with Treves who offers him a home at the hospital. The play is more successful in its exploration of Merrick’s view on women and – in deviating nicely from the film version – his latent sexuality. This theme culminates in a powerful scene where Mrs Kendal (a stand out performance by Grainne O’Mahony) compassionately violates social protocol and removes her clothes for Merrick. The set designs are relatively sparse but effective and a few moments of nicely executed comedy – such as when Treves reacts to the description of a half-man, half-elephant with an incredulous “Is he foreign?” – which produce moments of laughter. Finally, the casting of Beddard gives the performance a novel dimension; while early depictions of the real life Joseph Merrick give necessary context for his severe deformities and other’s recoiling from him, one soon forgets this and it becomes Beddard himself who represents a contemporary notion of “otherness” and how we treat the less advantaged. No doubt, Beddard has had to endure stares and condescending pity. And it would be condescending to Beddard to automatically say that his performance is an unmitigated triumph; such is the nature of his delivery, it’s often difficult to use the same metrics for what constitutes great acting. However, Beddard carries off the lead role effectively and, particularly during the scene where he thanks Treves for saving his lunch tray from yet another horrified maid, a nicely timed comedic touch. It’s a portrayal that makes a thought provoking story even more so. 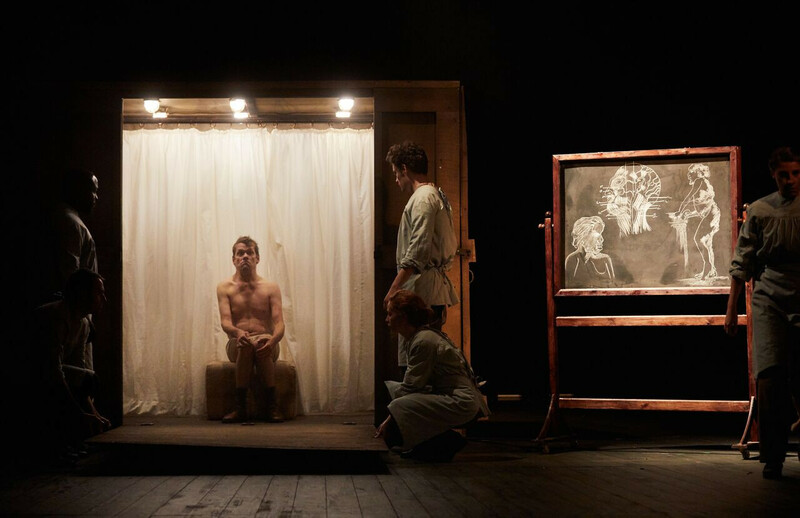 Tagged bristol old vic, review, scott hammond, the elephant man, theatre. Bookmark the permalink.